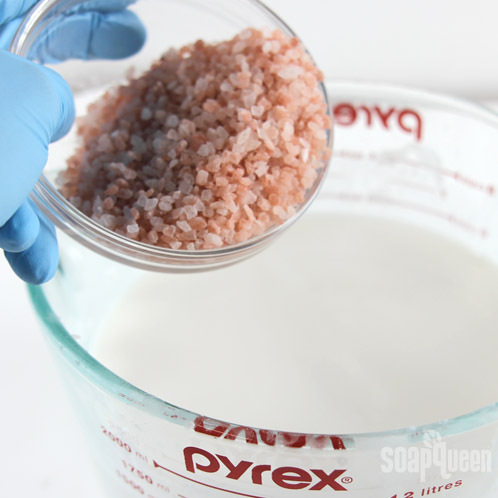 Transport yourself to the seaside of a breezy Mediterranean village with this #HomeSpa Pink Himalayan Sea Salt tutorial. Skin-loving Shea Melt and Pour base combines with scrubby Pink Himalayan Salt to create a bar that is both moisturizing and exfoliating. One thing to be aware of, this bar does not lather well because of the high amount of salt, but it is sensual and luxurious. Click here to add everything you need to make this project with the Spring Meadow Blend to your Bramble Berry shopping cart! Click here to add everything you need to make this project with the Essential Oil Blend to your Bramble Berry shopping cart! 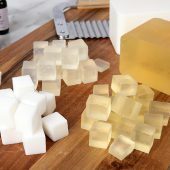 ONE: Cut the Shea Melt & Pour into 1 inch cubes and place in a heat safe container. Melt in the microwave on 30 second bursts, stirring between each heat. 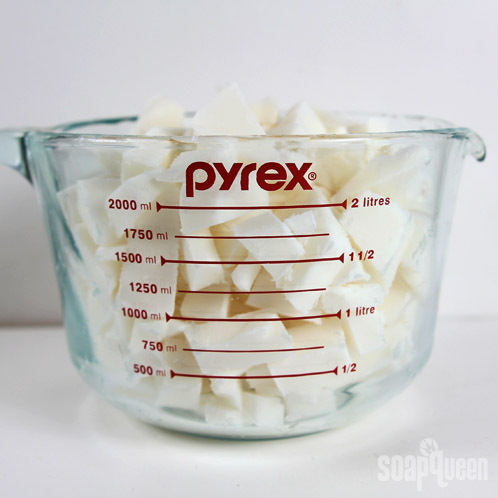 TWO: After the soap has been fully melted, shave off chunks of the Super Pearly White Color Block and stir vigorously to melt the color block into the soap. 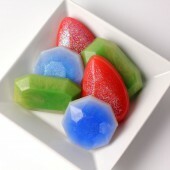 Since the soap is already white, the color block will add a slight shimmer to the soap. 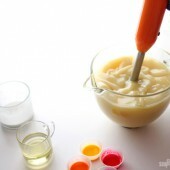 THREE: Add the fragrance blend and stir with a whisk or spoon until the oil has been fully incorporated into the soap. FOUR: Portion out the Medium Pink Himalayan Sea Salt and add it to the soap. The crystals will sink to the bottom of the soap. This is part of the design and is difficult to avoid because of the thin viscosity of the soap when melted versus the heavy grains of salt. FIVE: Because the salts are heavy and will sink to to the bottom of the container, use a spoon to scoop 2 – 3 spoonfuls of sea salts into each mold cavity to enhance the evenness of the design. 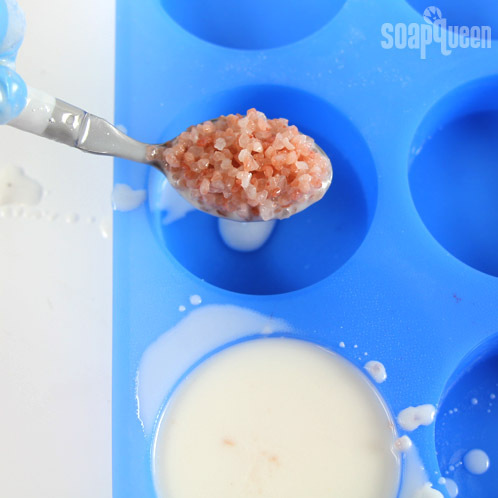 Yes, you are pulling the salts from the melted soap that you just put the salts into – reach your spoon all the way into the bottom of it to get a heaping spoonful. After you have an even coat of salts, pour the melted soap over the salts and spray with Isopropyl Alcohol to disperse bubbles. Repeat this process for each cavity. 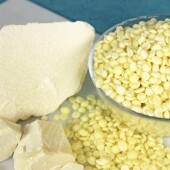 If the soap starts to harden, pop the mixture into the microwave for 15 seconds. 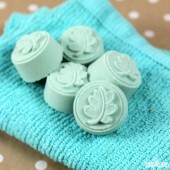 Allow the soaps to harden for 2 – 3 hours before unmolding! Wrap in saran wrap (not sure how to do that? 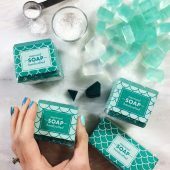 Watch Episode 11 of SoapQueen.TV), download the FREE label templates, print on label stock and stick onto your soap for a professional, finished look. 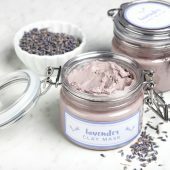 Can I make this without fragrance or will that somehow change the recipe/consistancy? Hi. Would this still work as well using the disc mold and package, plastic? 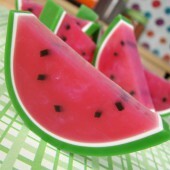 I would love to make these but don’t have the mold on hand. Just make sure to pour your soap at 150F or cooler. If the soap is hotter than 150F, it may warp the plastic. Hi! I was wondering, where would you list the salt on the label? I’m not sure what the exact recipe of MP is to list in order of amount, and usually I’m using a lot less of an additive. Thanks! 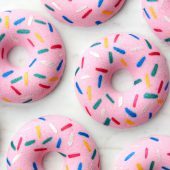 Would it be possible to do something like this with sugar instead of salt? 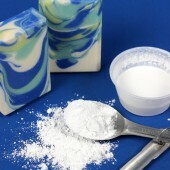 Or maybe just sprinkle some sugar on the tops of the bars after I pour the soap? I like the idea of an exfoliating bath bar, but I don’t have any salt on hand. I love this idea. I’m wondering. If I bought a soap base a pour and melt soap base would I have to let it cure for three weeks before using it. Or would I just add my fragrances, and coloring and let it harden and then use right after. 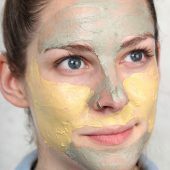 Hello I’m new to melt & pour soap making and I’m in love with your site. I bought a sea salt from Walmart and used it in my “lemony zesty” soap. After about five days I notice the top of the soap was getting soft where the sea salts are. Why is this? What am I doing incorrectly? 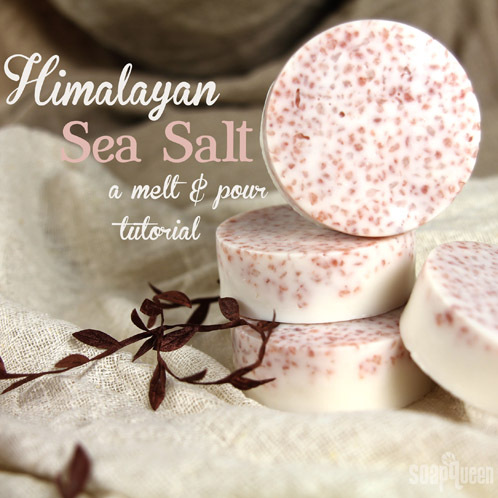 It sounds like the sea salt may be absorbing the moisture from the soap and getting soft. I’m so glad you have been enjoying the blog. Because you are not working with lye, you do not need to wear gloves or eyewear, unless you feel more comfortable doing so. Cold process soap can a little intimidating, but when lye is handled correctly, it is perfectly safe 🙂 I hope you do give it a try! 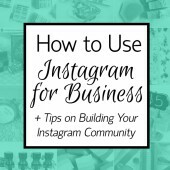 The blog post below is full of great resources for beginners! 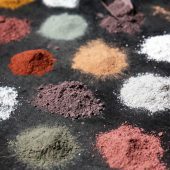 How much of the color block is used, in ounces please? We did not measure how much of the color block we added. The great things about color blocks is that you don’t need to be super precise, what you see is what you get, so if you’d like more color (or in this case, white shimmer) you can add a little more :). 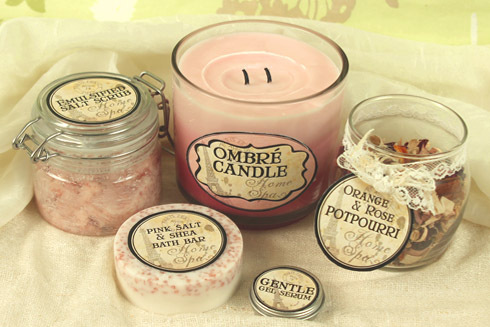 I just made this but I used pink grapefruit EO’s and it smells amazing and so fresh. While this looks easy to do it was a little odd. First the salt clumped up on the bottom of my bowl and even with stirring it would stick together in chunks. Then while trying to pour it starting setting up. Needless to say I had to add more soap and add to them. They don’t look very pretty so I hope the underside looks better. Will the chunks of salt that I was able to get in the mold be too rough on the skin? I’m sorry to hear that this recipe gave you a few problems. Sometimes working with salt can be a little tricky. You did the right thing in adding more melt and pour. Melt and pour can harden up quickly, so you have to be ready to think and move fast! 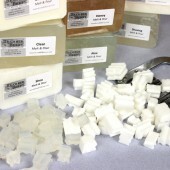 To avoid some of these problems, we melted our soap completely, and stirred in our salt to avoid clumping. Then using a spoon, we got a spoonful of soap and portioned it into the cavity, and poured the soap on top. I think your soap will probably turn out just fine :). 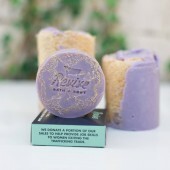 It’s hard to say if they will be too hard on the skin…personally I can tolerate pretty scratchy soap! Haha. 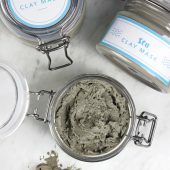 If it’s on the scratchy side, you may really like to use it on your feet as a exfoliant! I was so excited to have these arrive in the mail today that I stopped what I was doing just to make them. And now, boy, do I feel dumb! I melted the m&p just fine. When it came time to add the FOs I messed up in a way that you can all find humor in. I saw the recipe that called for a small amt of just the Spring Meadow (Ithink), but I ordered the kit with 4 different FOs. All I saw at first was the list of ingredients that came with the kit. I ASSUMED, that that was the amt of oils to use… Needless to say I’ve emptied 4 brand new bottles in my stupidity!!! At least I had the sense to pour them into a bowl before dumping them into the m&p! Instead, I just put several droppers full of my “mixture” into the soap. My other problem is that when I added the sea salt, it clumped. I had to pry it out with a spoon to get it into the molds… then there wasn’t much m&p to cover the tops. The fragrance did turn out kinda nice, I have to admit! I did add the salt to the m&p and that’s where my clumping mess started… Like I said, I had to scrape the bottom of the bowl to get the salt/m&p mixture out. This left very little m&p to fill the molds fully. I think I got 5 relatively ok bars out of this disaster 🙂 Maybe if I had had more m&p to add, it would have turned out better. Live and learn and have extra m&p on hand next time! O-M-G! I am so in love! This was my first experience with M&P soap making. I did a quick scan of the M&P recipes and didn’t really see much like this. You know, the spa-like soaps. 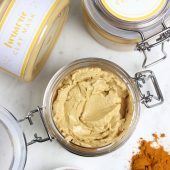 Do you have any you can recommend that have this spa quality to them? I’m not crazy about the really colorful stuff with crazy shapes and colors. They are cute, but I just love the relaxing type. Thanks! 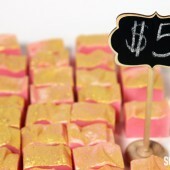 if you loved this Melt and Pour project and like the spa like feeling bars, have I got some awesome tutorials for you. Finally, this is a fun tutorial that has exfoliating embeds in them. I tried this and the scent is great!! 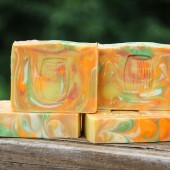 However, the EO turned my soap a pale orange or off yellow color. I am guessing because of the Red Brazilian Mandarin. I am using Brambleberry everything so was that supposed to happen and is that why you all added the Color Block? 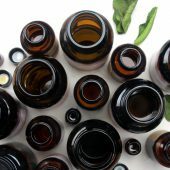 Do you sell a rose essential oil that will not turn the soap yellow? The English Rose Fragrance Oil is another option, but it does result in a more yellowish color. I tried this reipe last night, but thought I’d give it a twist by pouring it in a 3 lbs log!… Big mistake! It looked great once released from the mold, until I tried to cut in into bars. The salt at the bottom was like a hard layer of candy, just crumbling and breaking off, not making a nice clean slice!…I immediately decided to remelt the batch and pour into muffin tray! OH BOY!!! Long story short, the mixture wasn’t melting as fast due to the salt clumps and the soap was thick and skin was forming….what a mess!!! 🙁 I manage to pour a few nice round bar, but over all the mix was very think and lumpy! What a waste! P.S. Did I mention that I used lip flavoring instead of EO. I thought, what the heck? 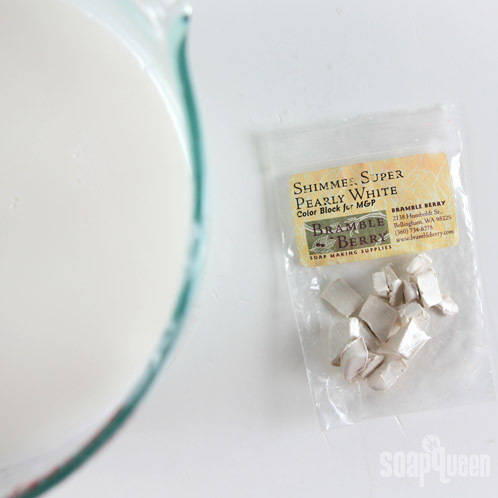 I love this scent of coconut along with sea salt!…mells like the beach! Well this morning the soaps have oily residue on the surfaces, almost like they’re sweating where the salts are. 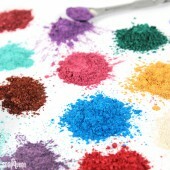 I’m almost sure its the lip flavoring not being approprite mix with the soap! I knew I was taking a risk from the get go! I’m sorry to hear that this recipe gave you some trouble. We have all been there though, so don’t be too hard on yourself! 🙂 I could see where a log mold would be appealing for this recipe. The reason we added the salts to the mixture first, then scooped them out into the individual mold was so the salts didn’t all go to the bottom,forming a somewhat solid layer, which it sounds like is what happened to your soap. I’m sorry that the lip flavoring oil gave you trouble, but you’re correct, these are not made for use in soap. 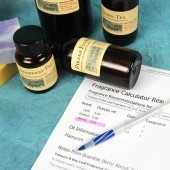 They have a different usage rate than fragrance oils, which may be where the major problem is. 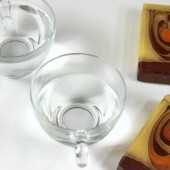 Keep in mind that melt and pour can sweat due to the glycerin. We usually recommend wrapping your melt and pour after it has been made to avoid this problem. 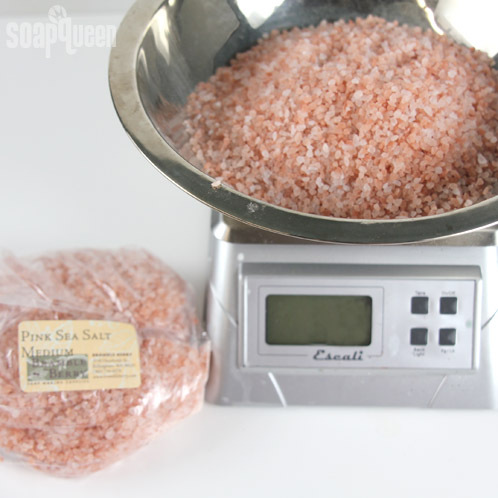 I wanted to write in and tell people what not to do-lol I read one of the comments that said she used the weight of soap as salt to get a more even mix of salt so I thought I would do that-I used a little less salt but it was just a couple ounces less than the soap used. It seized up immediately and could not get out of the pan-not knowing the chemistry of salt-I decided to put it back on the double boiler and try to soften-wasn’t happening so I added in a little more soap-a major mess let me tell ya lol-the salt must have melted into the soap or chemically changed. so I put it in one of those plastic veggie containers and figured I would just use it for myself-well it is chemically changed for sure-so is not setting up well-I will just scoop some out for me and see if I can use it after a couple hours it is still not set-so it’s not going to. I’m sorry to hear this gave you such trouble! Sometimes projects take a little trial and error :). 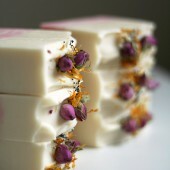 You can use dead sea salts in melt and pour soap, although sometimes suspending things can be a little tricky! 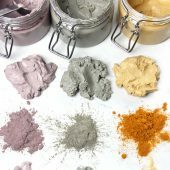 While our melt and pour bases aren’t technically called suspension bases, that doesn’t mean that you can’t suspend additives in our bases! The key is pouring at a lower temperature, around 120 degrees F, to increase the viscosity of the soap. 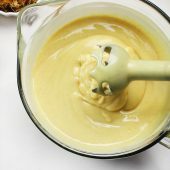 This combined with continual stirring as you pour will allow for great suspension in our melt and pour bases. 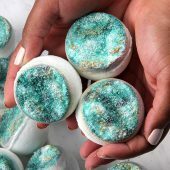 Hi, once I made the CP soap with just 3 Himalayan salt crystals embeds (coarse grain) on top and when I tested it was way too scratchy… I had to remove those embeds from all finished batch and replace with with shea butter drops. The bar itself also contained fine Himalayan salt in a base and it was a bit rough to the skin leaving light red scratches after the use. I’m wondering why nobody mentioned this… Did you experience something like this or maybe heard about it from people? I LOVE the look of Him. salt but simply afraid to repeat the same mistake. Don’t want angry customers to sue me… What do you think? Thank you! I’m new to soap making. I purchased this kit with the essential oil blend. I just realized I have all the oils minus the “patchouli”. 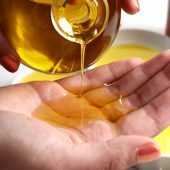 I wanted to make the soaps tomorrow, how will not having this oil effect my oil blend? 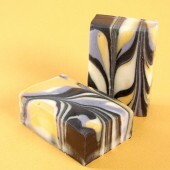 Should I order the patchouli and wait to make the soap or is their an alternative option? 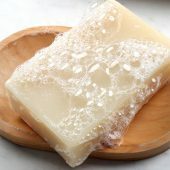 I would like to preserve the quality and recipe of this soap, but I’m eager to get cooking! Thank you so much for the response! 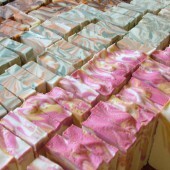 I made the soap (minus the .4oz of patchouli). Question though, my soap is not pearly white like yours! I know there much be an obvious answer and I’m simply overlooking it. 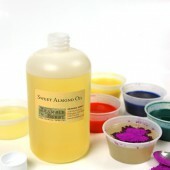 It was white from the Shea butter and the color block- but the essential oil mix turned it amber colored. Did I use too much of the oil mix? Was I only supposed to add a fraction of that oil mixture? 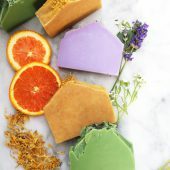 I could have sworn I read somewhere else estimate about .25 oz fragrance per pound of soap- that would be I used four times too much oil blend. But I followed what I read above. That’s the only explanation I can think of! It looks like your soap turned a different color because of the essential oil you used. 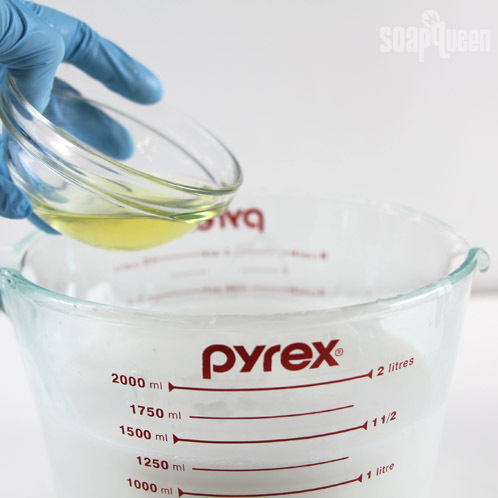 We recommend using .25 ounces of essential oil per pound of melt and pour soap. If you’re worried about using too much you can remelt it all and add some extra melt and pour base so you can be at a skin safe usage rate. How could I go about making this on a stove top? I do not have a microwave and I find Pyrex to be not reliable with heat. Any advice is appreciated. Thanks! Hi! 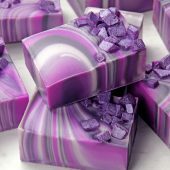 I’m new to soap making and would like to try this for Christmas gifts. I just had a couple questions. Is this recipe OK to half? I think I read somewhere that you have to be careful when halving or doubling recipes… but that might have just been for cold process. 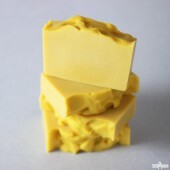 Also, if I were to just use a large square or rectangular mold to cut my own bars, should I still put the salt in the soap mix before spooning it out to cover the bottom? 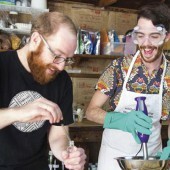 Welcome to the soapmaking world, we are so excited that you have decided to start. You can totally half this recipe! 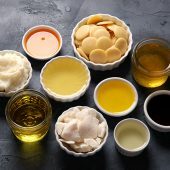 Because it is melt & pour, you don’t have to worry about lye and oils and the saponification process. I made these and used the ‘foot’ mold. Too cute. 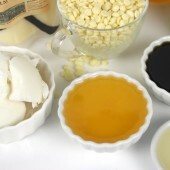 I also used the Holiday Candy fragrance oil and I added sugar to the salt mixture. 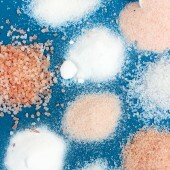 Sugar hydrates the skin, as salt dries it out. 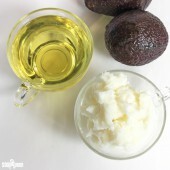 I did not use the Shea butter soap, and I see now that shea does hydrate and that is why the recipe did not call for sugar. But anyways, my recipe turned out fine and it is M&P. 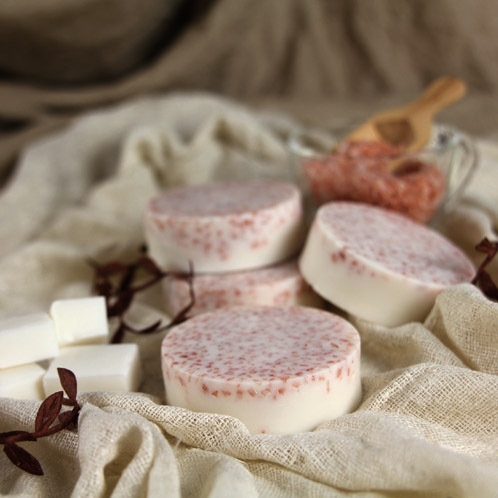 We included the Pink Sea Salt in this recipe because it is known for it’s stimulating and soothing properties and we just love it in salt bars for it’s exfoliating and moisturizing abilities. •How big are the molds you used? •For the wrapping, is there an alternative for a heat gun? You can use any size of salt you would like in this particular recipe. We liked the medium because it worked perfectly for the scrubbiness we were going for. The heat gun is the best way to wrap your soaps if you want a professional and smooth looking packaging. If you don’t have a heat gun, you can just wrap your soaps in plastic wrap and they will be good to go. In this recipe you say a block of Super Pearly White Colour Block. How much is it in ozs please. i tried this with goats milk m&p scented with coco mango fragrance oil. it looked and smelled good but gave a unexpected warm tingling sensation? is that normal? i gave the ” feets only disclaimer”. this is my first time adding salts in it… and suggestions? Could you tell us a bit more about your recipe so that we can help you troubleshoot? We always suggest making sure that you are using the correct usage rate of fragrances your projects. For melt & pour we suggest .25 oz per pound. If you let us know more about your recipe we can pinpoint what might be causing that tingling sensation! 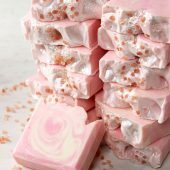 I can’t wait to order this kit and make the soaps! I just have a question as it says to ‘portion out the salt’ and I’m wondering how much salt. To your liking? Equal parts soap and salt as one comment came in? Just curious; I’m sort of a recipe person. 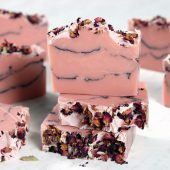 I have a question….is it possible to make a black detox soap bar using a version of this Pink Salt and Shea Butter bars recipe. Maybe adding charcoal and black hawaiian lava salt? Any sugguestions for building a recipe? 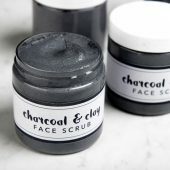 You could totally make a melt and pour bar with the Activated Charcoal and salt of your choice. 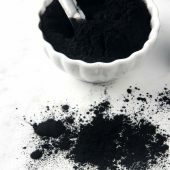 I would work along the same lines as this recipe for the salt and experiment with different rates of the Activated Charcoal until you find an amount that works the best for you. 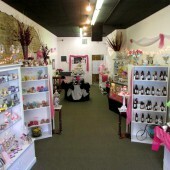 =) We can’t wait to hear more about your new soap! 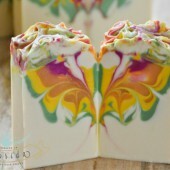 This project was pretty easy to make and the soap came out looking beautful. Here the best part…I sold it at a craft show and was sold out in less than 2 days….It was a hit! This was my second melt and pour project. I was so happy!!!! I basically used your fragrance blend but substitued essential mandrin oil for orange fragrance. I just made another patch!!!Yah! Thank you so much for your tutorial! 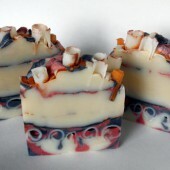 I made this soap with raspberry and pomegranate scent and LOVE it!!! I did notice though that 3 weeks later the soap started to sweat – a lot. I had it wrapped in plastic and kept it in a dry, cool place – any ideas on why it sweated so much and continues to keep sweating – even after I have wiped it dry? (Is it a chemical reaction of the salt? Any help you can provide is much appreciated! 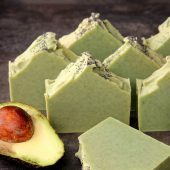 It sounds like you might be living in an area that is a little humid and that is what is causing the sweating along with the salt drawing the moisture into your soap. What are the typical temperatures in your area? The area is pretty moist/damp (I live in Vancouver, BC) and lately the weather has been pretty muggy/humid. I have noticed that when I take extra care to remove all of the air bubbles from wrapping that it is fine – the salt can’t ‘sweat’ – I am hoping it stays that way. Thanks for your assistance! I made this with the fine salt and the Sheer Freesia scent and it’s lovely! I had a problem, though…the first bar came out of the mold just fine, but in the subsequent bars the salt is sticking to the mold and not releasing well. I’m using the plastic mold, not the silicone. Do you think it won’t work in the plastic mold, and I just lucked out on the first one? Otherwise, I beautiful bar of soap! The hard plastic molds are going to a little trickier to unmold but it can be done. When they have hardened, push on the back of the mold cavity firmly with the palm of your hand. I would also try pushing the sides away from the soap if at all possible that will release the airlock and help them pop out. Can I use fine salt? I did it and doesnt look bad. Still haven’t try it on my skin yet. I got the fine salt instead of the larger one. Used the shea butter M&P base, with fine pink Himalayan salt & grapefruit fragrance oil (was what had on hand). So far I’m LOVING IT! Have made 2 & 4oz bars. Yay! 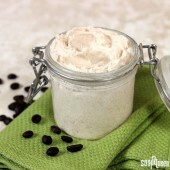 I am so glad to hear it turned out so well for you, it is one of my favorite of the home spa recipes. Have you had a chance to check out our other recipes in the series yet? Yes! 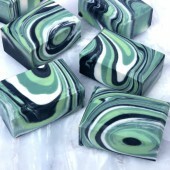 This soap is great, we had some in the office for a while and I loved using it. I can’t wait to see your spin on it – if you get the chance, stop by our Facebook page and post a photo of your soap! This was my very first time making any kind of soap, but it turned out BEAUTIFULLY and I am in LOVE! 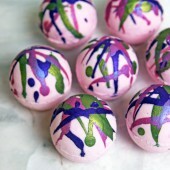 I definitely want to try and make these soon. They are packaged so nicely, too! Is this soap scratchy during use? How crazy! My VERY FIRST melt and pour project was a Pink Himalayan salt bar that I made for my family for Christmas. 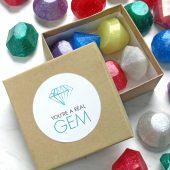 I scented them with your Pink Grapefruit fragrance oil and everyone LOVED them! My Mom still has some that she uses in the kitchen. 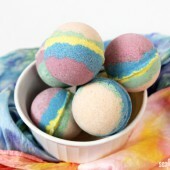 I had included bath salts and handmade rice heat packs and they were a big hit. The only difference is that I used Goat’s Milk base and it still lathered rather nicely – but I only used enough salt to cover the bottom of the mold. I love the way these look! I don’t usually do melt and pour but I totally want to try this! Love this. I haven’t worked with pink salt yet, this looks like a great project. 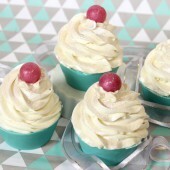 You will just love this recipe. We’ve had a tester in the restroom here at work and I just can’t wait to wash my hands with it. 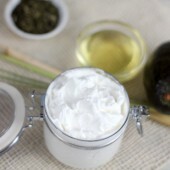 The salt gives that perfect amount of exfoliation, and the shea butter base is just so creamy! I’ve been making very similar soaps for about a year now (I don’t add white pearl to the shea base and I scent mine with Lavender & Herb). They’re always best-sellers at craft shows and the local farmers’ market! To counteract the sinking salts, I just add more – almost an even ratio of weight for the soap and salt. It makes a sticky, goopy mess to spoon into the mold, but the results are worth it. 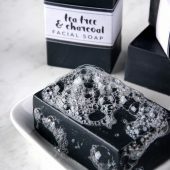 I always warn my customers that the soap might not lather as much as others, but no one has ever complained and everyone who purchases it once always comes back for more.